As I mentioned earlier semba is perhaps Angola´s most popular dance form. But there are others also worth mentioning. This week let us take a closer look at semba, Kizomba, Capoeira de Angola and Luanda’s Carnival. Semba is a high tempo dance that gets its name from “Masemba”, a word which means “a touch of the bellies”, the motion that characterizes this type of dancing. Semba originated in the seventeenth century in the coastal areas of Angola around Luanda and Benguela. It was a dance that celebrated special events such as births, marriages, and good harvests because it is capable of conveying a broad spectrum of emotions. Before the arrival of the Portuguese the semba dance was part of traditional religion. Dancing accompanied the worship of the godess Kianda, in honour of whom food, clothing and other gifts were thrown into the sea. Many Angolans believe that semba may have given birth to Samba, Brazil´s national music. The transatlantic slave trade of the seventeenth century forced the relocation of countless enslaved Africans, who took some of their cultural traditions with them. Semba is often accompanied by music played on traditional Angolan musical instruments such as the tarolas (snare drums) and the dilongas (bass drums). However semba is far from being merely an archaic tradition. Semba keeps pace with the times through the efforts of innovators such as DiaKiemuezo and Bonga, who strive to popularize this music and dance internationally. Other young artists and groups, are joining veteran semba musicians to reclaim the style’s old popularity, which had began to decline somewhat. Examples of musicians “taking this route” are Flores and Maravilha, a band formed in the early 1990s. They are all worth a listen. Kizomba and tarachinha are similar to semba but are more intimate, sensuous, and slower than semba. The origins of kizomba are unclear. Some defend that it is of Angolan origin with influences from other Lusophone countries, others hold that it originated on the Cape Verde Islands. Whatever its origins, what cannot be debated is that kizomba is known, and danced, throughout Lusophone Africa as well as in Portugal itself. In fact, kizomba is usually sung in Portuguese with African rhythms. Angolan musicians who play kizomba include Flores, Paim, Murras, Irmãos Verdades, and Don Kikas. Tarachinha is an even more seductive dance than kizomba. While kizomba is normally danced with the partner held in a light embrace, in tarachinha dancing partners are locked in a rather tight, sensual embrace and dance in a very slow manner, almost not moving. Throughout Angola´s history, due to the slave trade of the 16th and 17th centuries, there have been constant exchanges in culture and customs between Angola and Brazil. One example of this type of exchange is the mbulumbumba. The mbulumbumba is a bowed instrument, which is indigenous to Southern Africa but is better known by its Brazilian name, berimbau. The berimbau is played by holding a stick (baqueta) in the right hand, striking the wire of the bow (arame) and controlling the resulting sound by pressing the gourd (cabaça) towards or away from the abdomen. The berimbau is integral to the practice of Capoeira de Angola, a martial art and acrobatic dance form that is a popular Brazilian national tradition. While Capoeira de Angola is that is more identified with Brazil than Angola, its roots are from Africa. There are even some who say that Capoeira was practiced in Angola during pre-colonial times and that it was banned by the Portuguese colonialists. In Brazil Capoeira was a way by which enslaved Africans confronted slavery. In its original form, Capoeira’s martial art aspect was subtle and disguised, hidden “beneath” the acrobatic dance. Hidden in plain sight! Definitely not hidden, or subtle in any way, is Luanda’s Mardi Gras parade. 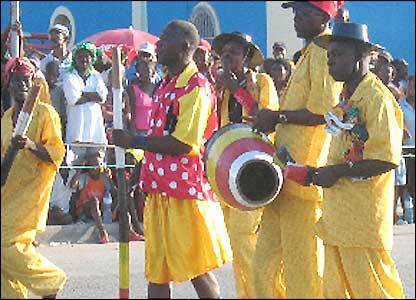 This parade is one of Angola´s most important cultural events. The Mardi Gras Carnival was inherited from the Portuguese, with much infusion of African culture through costume and music. This three-day carnival draws a very large crowd. It features a parade of grupos carnavalescos (carnival groups), drawn from Luanda and its neighborhoods, colorfully attired, in masks and decorated headgear. All these groups compete for prizes based on the quality of their dance and music. If you would like to know more about Angolan Dance, the Carnival is a good place to start!